Turnover continues on Queen west of Spadina as we head toward the end of the year. At the corner of Queen and Tecumseth, Vdara has been shut down by their landlord for failure to pay their rent. Despite generally good reviews, the restaurant never seemed to pack in the crowds. But I guess most area residents could have predicted this one. Habitat couldn't make this large corner spot work and Satori Supper Club flamed out in a hurry in between. Who's going to have the gusto to take over this lease next? A couple of blocks east, clothing boutique Fashion District has called it quits. They had a big sale earlier this month and since this photo was taken the store has closed and the window papered over. Could this have been predicted? Their web site never got the promised September 5th refresh. 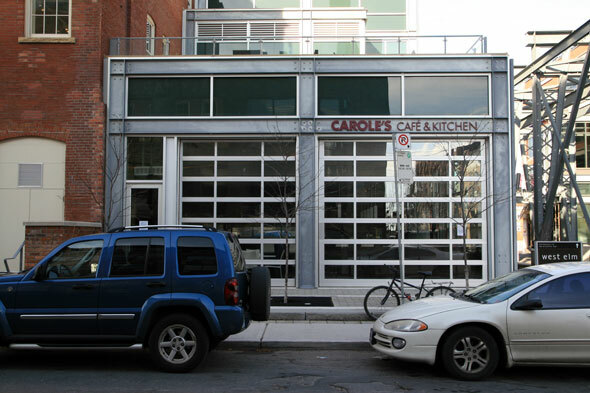 Finally, at the beginning of this month Carole's Cafe in Liberty Village was also evicted by their landlord. The notice on the door was dated early September so apparently their rent was in arrears for a while. The place was never too busy and couldn't really find a way to connect with the neighbourhood's lunch crowd.